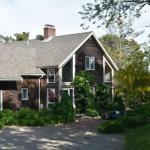 Chatham Beach Cruiser offers pet-friendly accommodation in Chatham 3.3 km from Chatham Light Beach. Free WiFi is provided. The home offers 5 bedrooms in 2 separate living spaces with separate entrances. Keyless entry is provided for convenience. Chatham Beach Cruiser has a media room and an outdoor deck with a Bose speaker system. A stainless steel barbecue is available for use. Activities nearby include golf bike trails and antique shopping. Scatteree Beach is within walking distance. Chatham Light Beach is 3.3 km from the property while the Chatham Shark Center is 650 metres away. The nearest airport is Nantucket Memorial Airport 50 km from the property.